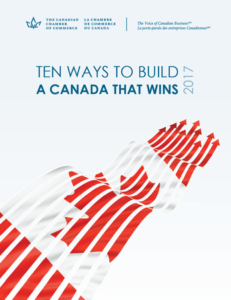 For the last several years, the Canadian Chamber of Commerce has published an annual list of the Top 10 Barriers to Canadian Competitiveness. That document listed some of the self-inflicted wounds that have prevented Canada's economy from achieving its full potential and set out their recommendations for change. This year, they released a different document. Instead of focusing on barriers, they outlined 10 ways to improve our economic success, along with specific recommendations to advocate throughout the year.